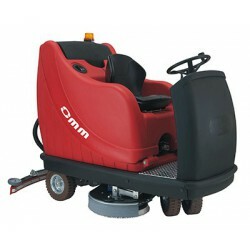 The OMM STILE-800 battery-powered ride on scrubber-dryer is a scrubber-dryer with excellent movement and maneuvering power that allows easy access to small work areas. It is manufactured with a tubular chasis with thermo-hardening paint and polyethylene tanks that resist acid from the batteries and industrial detergents. It also has electronic regulation of the brushes' pressure and good perfomance in medium and large surfaces. 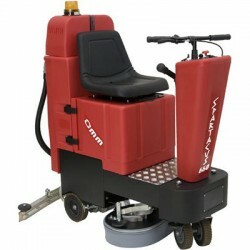 This battery-powered ride on scrubber-dryer also has no-track and anti-slip polyurethane wheels, moto-reducer with permanent lubrication of both brushes and 1 by-pass vacuum motor. This machine also comes with ergononomic controls and a steel squeegee with the latest technology.